The Ring Nebula, or Messier 57, is a famous planetary nebula located in Lyra constellation, south of Vega, the fifth brightest star in the sky. The nebula was formed about 4,000 years ago, when the central star, a red giant, ejected a shell of ionized gas in the final stage of its evolution before becoming a white dwarf. M57 is classified as a bipolar nebula, one whose equatorial rings visibly enlarge the nebula’s structure and give it a symmetric bi-lobed appearance. It is often confused with the Helix Nebula in Aquarius, another famous planetary nebula that has the appearance of a celestial eye. M57 appears face-on when observed from Earth and is relatively easy to find in the night sky, which makes the nebula is a popular target among amateur astronomers. It is located to the south of Vega and lies about 40% of the distance from Beta and Gamma Lyrae. The nebula is best observed with an 8 inch telescope (at least) as it is too small to be resolved with binoculars. A 4 inch telescope requires a magnification of 100x to show the nebula’s interior hole, while a 3 inch telescope will show the nebula’s ring shape. The central white dwarf has an apparent visual magnitude of 15.75, which makes it difficult to observe. The star has a surface temperature of 125,000 K and is about 200 times more luminous than the Sun. It was first discovered by the Hungarian astronomer Jenő Gothard in September 1886. The Sun will have a similar fate in about 5-6 billion years, but as it is less massive than the Ring Nebula’s progenitor star, once it becomes a white dwarf it will heat more slowly and the planetary nebula that will form once the Sun has ejected its outer layers will be much fainter because by the time the central white dwarf is hot enough to illuminate the nebula, the ejected material will be further away. The Ring Nebula has an apparent visual magnitude of 8.8 and lies at a distance of 2,300 light years from Earth. The nebula’s other designations are NGC 6720 (New General Catalogue) and GC 4447 (Boss General Catalogue). The nebula expands at a rate of at least 43,000 miles (about 69,000 km) per hour, or about 12 miles (19 km) per second), which means that it expands by 1 arcsecond across the sky every 100 years. It has been expanding for approximately 1,610±240 years and will continue to expand for about 10,000 more years. As a result of the expansion, eventually it will become faint enough to merge with the interstellar medium. 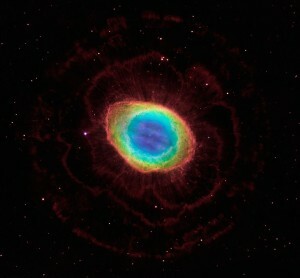 The Ring Nebula was discovered by the French astronomer Antoine Darquier de Pellepoix in 1779. Charles Messier discovered it independently while looking for comets, and included it in his catalogue as the 57th entry. Messier suspected that the object was formed by several dim stars that could not be resolved with a telescope. The Hungarian astronomer Eugene von Gothard was the first to photograph the nebula in 1886. In May 2013, NASA released a revealing new image of the nebula (featured), which shows that the nebula has a different shape and a more complex structure than previously thought. It is a composite image combining a visible light image of the nebula taken by the Hubble Space Telescope and an infrared image from the Large Binocular Telescope located in Arizona.